Alumna Kisha McGuire is a program counselor in the Fiat Lux Scholars Program within the campus’s Calvin E. Bright Success Center. Kisha McGuire has discovered an opportunity to do what she loves for an institution she’s grown to care deeply about. McGuire graduated from UC Merced in 2015 with a bachelor’s degree in sociology, and soon started a full-time staff position in the Fiat Lux Scholars Program within the campus’s Calvin E. Bright Success Center. As program counselor, McGuire works to ease income-eligible, first-generation students’ transitions to college and enhance their development. She meets with Fiat Lux Scholars at least twice each semester to check on their academic, professional, personal and social goals. 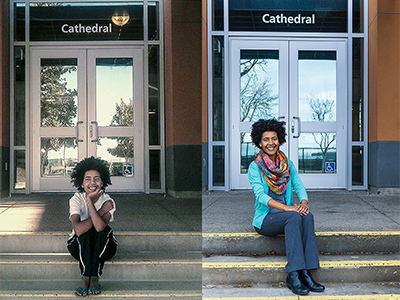 McGuire sits on the steps of Cathedral Hall where she served as an RA then (2013) and now. McGuire can empathize with her students. She was adopted from Ethiopia as a toddler and raised in Livingston with her biological sister. 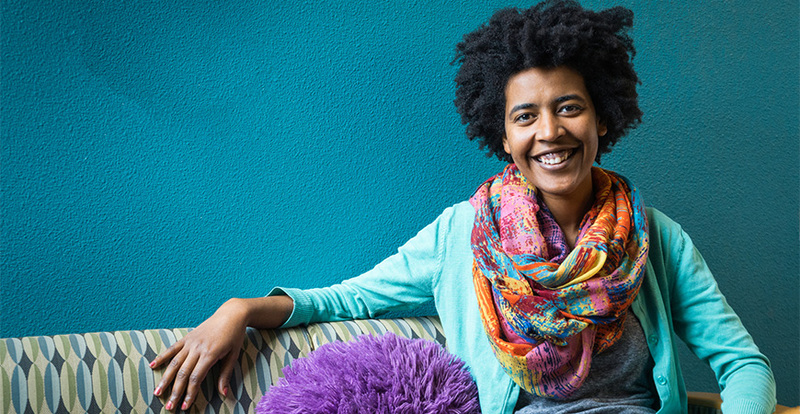 After enrolling at UC Merced in 2011, it took her two years to settle on a major. Before attending UC Merced, McGuire didn’t know about the field of sociology. She took an introductory course and left each class with a thirst for learning more. She also worked for two years as a resident assistant (RA) with Housing and Residence Life. This experience gave her the skillset she needs to now oversee the Fiat Lux program’s community scholars, who work alongside housing staff and RAs to support first-year students in the Fiat Lux Living Learning Community with a successful transition to college. My experience here as a student often plays a role in my decision-making process. The Fiat Lux program launched in the spring of 2010 with two staff members and 57 first-year students. Now, the program has four professional staff members and 16 student staff members supporting more than 200 students. The Fiat Lux Scholars Program offers workshops on a variety of topics, so scholars learn more in-depth knowledge on specific topics, meet other students and discover on-campus resources. The program offers include study sessions, faculty receptions and the First-Year Success course (USTU 010) that meets once a week to provide interactive lectures and small-group discussion sessions. For McGuire, the experience of working with students Fiat Lux Scholars Program has only continued her educational journey.